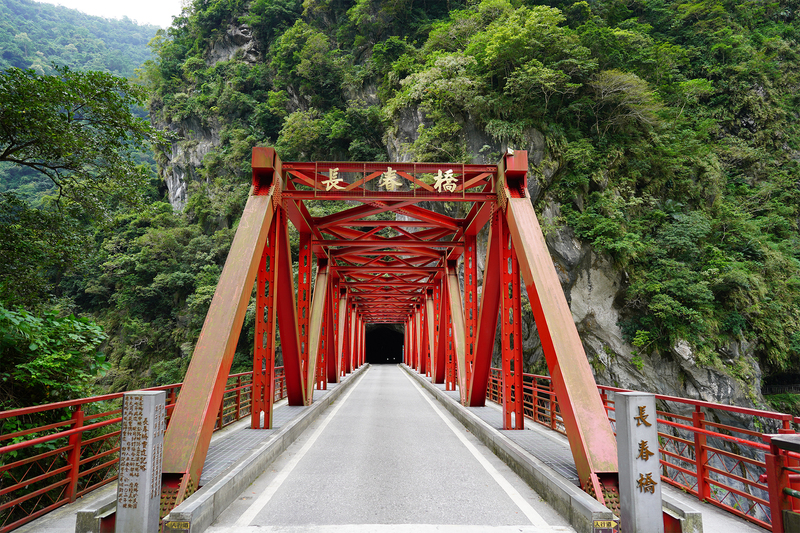 It’s difficult to find transportation from Qingjing (Cingjing) Farm to Hualien. 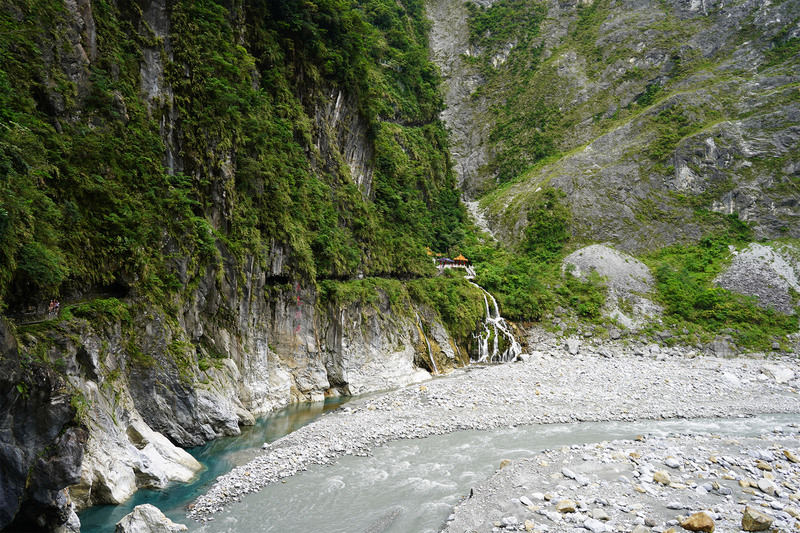 Tourism buses or trains don’t connect these two points — located on either side of Taroko National Park. Taxi drivers (from Cingjing) don’t like the journey because of constant road blocks, unpredictable weather, and empty rides back to Cingjing. 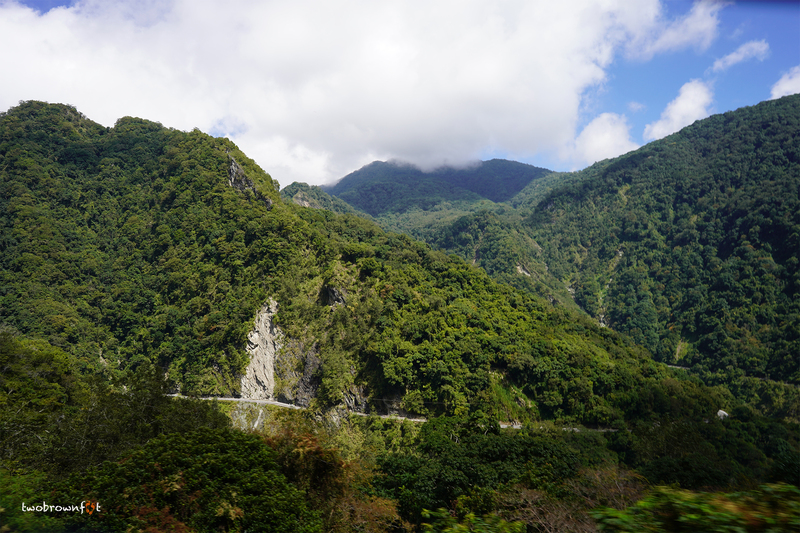 The manager of our B&B arranged a cab for us to Hualien. 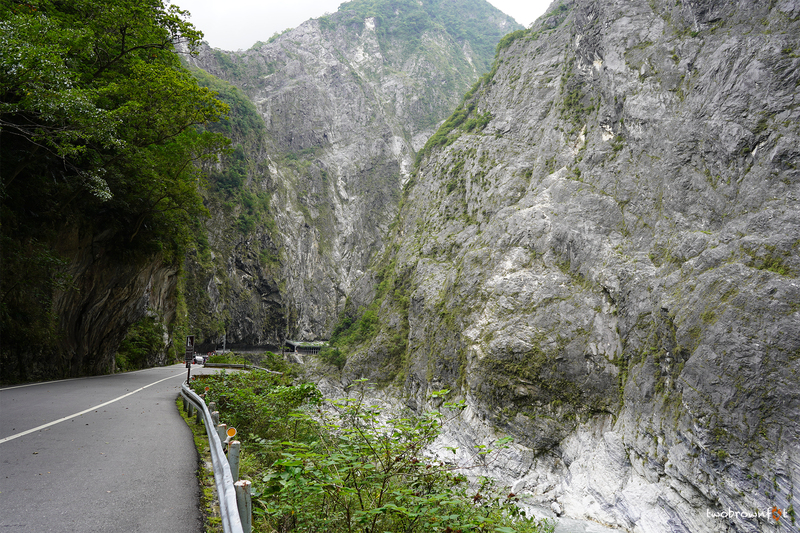 We added Taroko Gorge and Qingshui Cliff to the price of a pick-and-drop trip. The Google map (above) gives a rough idea of the route, but isn’t accurate for the time taken to cover this distance. 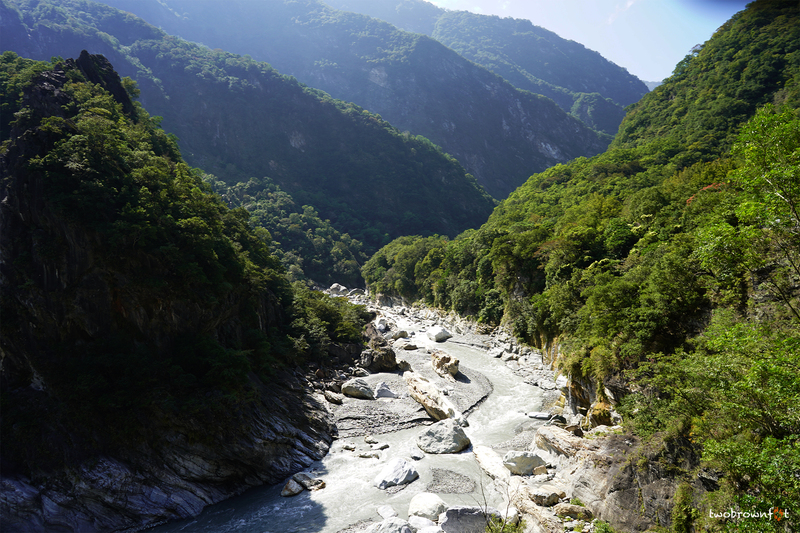 Taroko National Park spreads over an area of 92,000 hectares in the northern part of the Central Mountain Range. 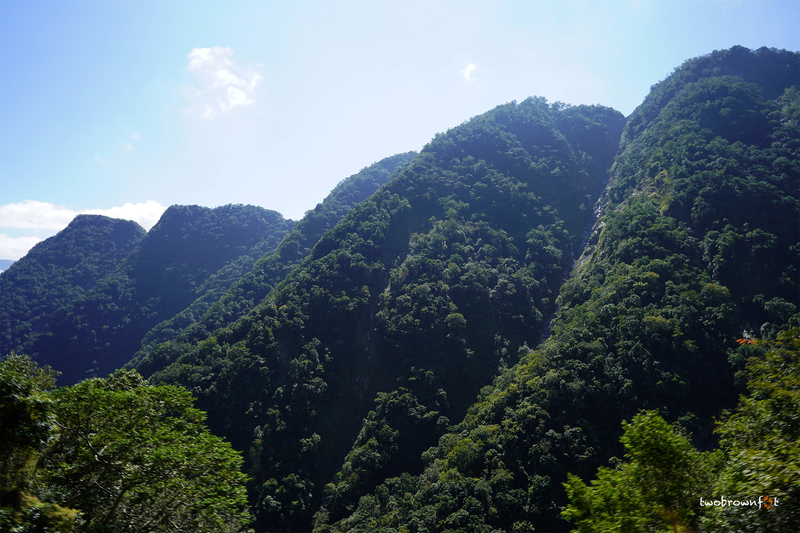 This national park was established in 1986 and aims to preserve the rich natural diversity of the region. 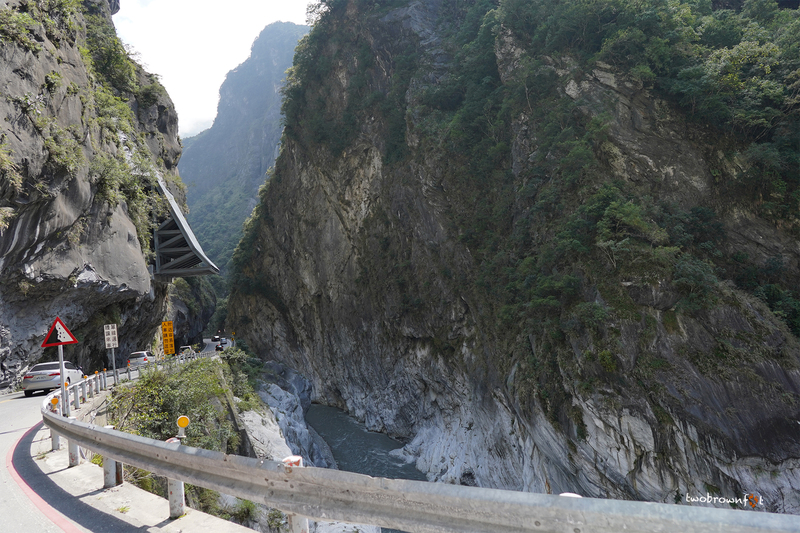 Taroko is famous for its high mountains such as Hehuanshan (around 3000 m above sea level) and the stunning Taroko Gorge. 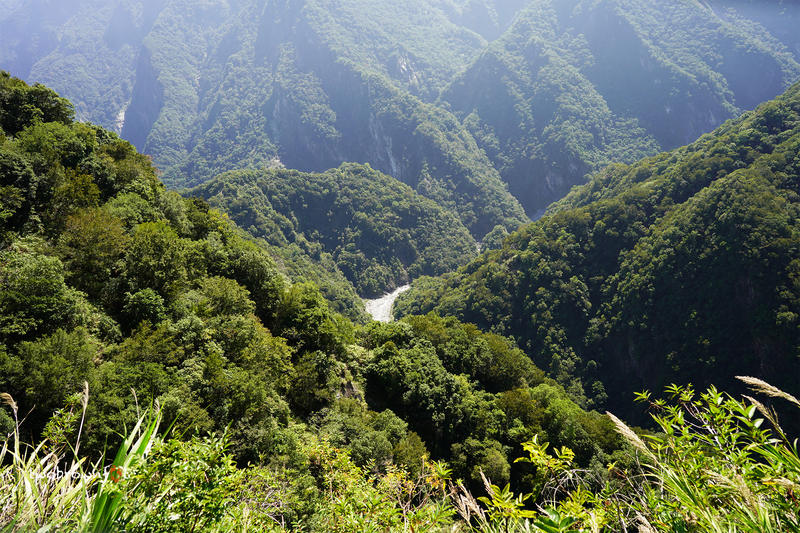 The dense forest cover of Taroko Narional Park is sandwiched between three counties: Hualien, Nantou, and Taichung. 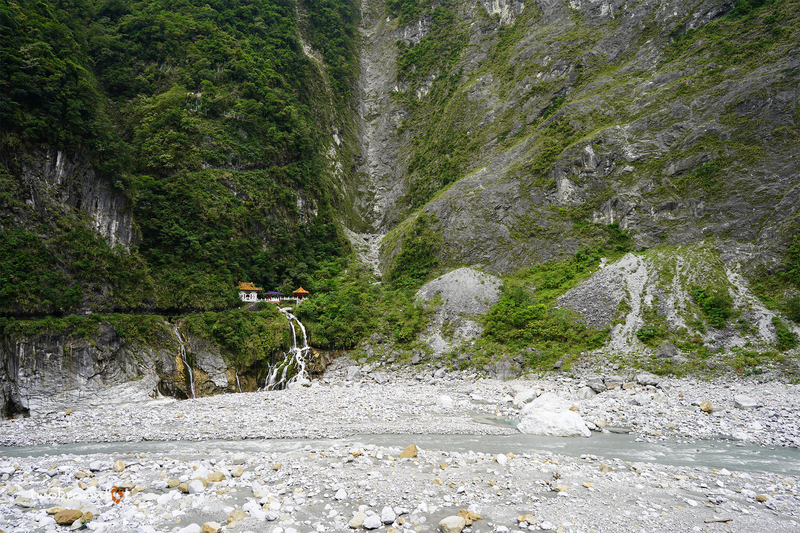 We left our B&B at around 11:00 a.m. and were pleasantly surprised to meet our guide/driver from the Hehuan Sunrise Tour. 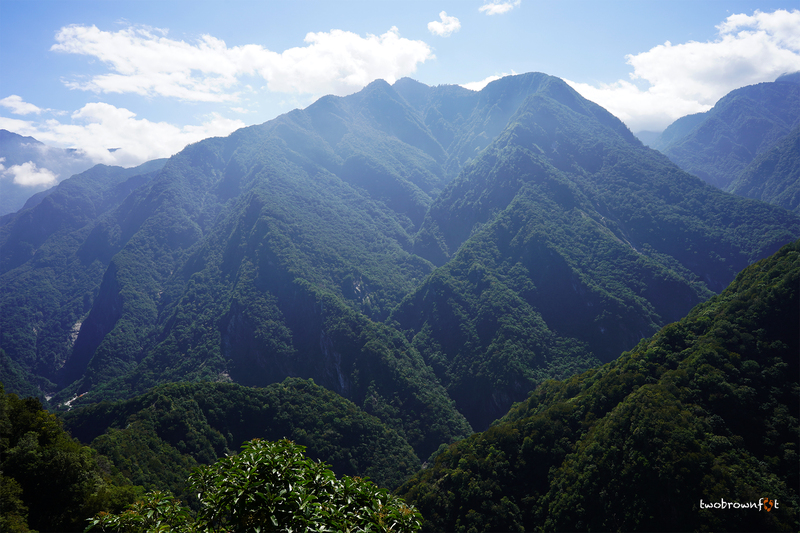 We had to pass Hehuan Mountains again and the peaks looked stunning in the morning light. Our guide tried to bond with us on movies and food. He spoke to us in broken English and was trying to be helpful. Unfortunately, cultural exchanges can be tricky when you cannot communicate well and harp on stereotypes. The mountain roads didn’t help me and I tried hard to be patient whilst he thought he was playing the perfect host. 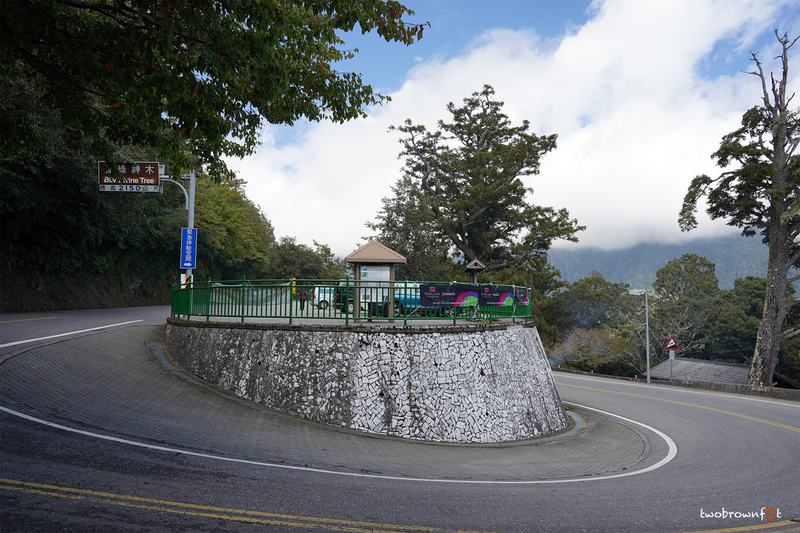 We stopped to refuel on the other side of Hehuan Mountains. Our guide/driver asked us to pick up some food from the local convenience store. I regret not getting something to eat because there aren’t many/any eating options on the rest of the trip. 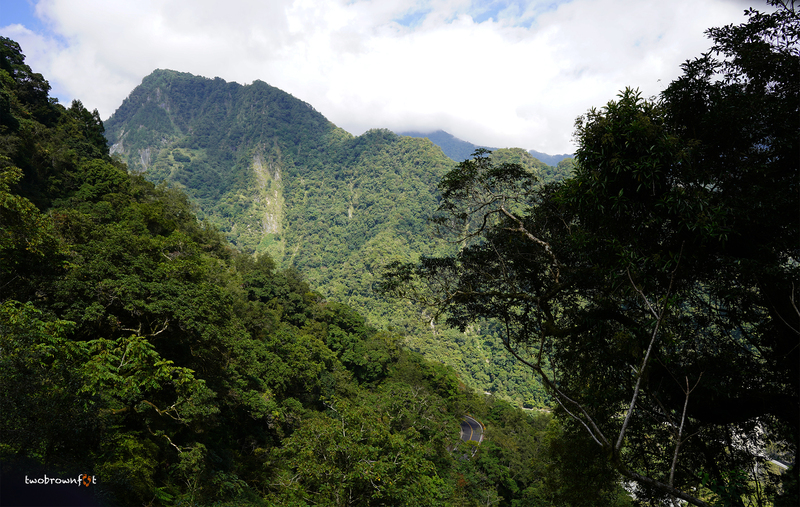 Our journey took us through the cloud forest. It was a sunny day and we didn’t pass through mist, but the sights were incredible (not in pictures). 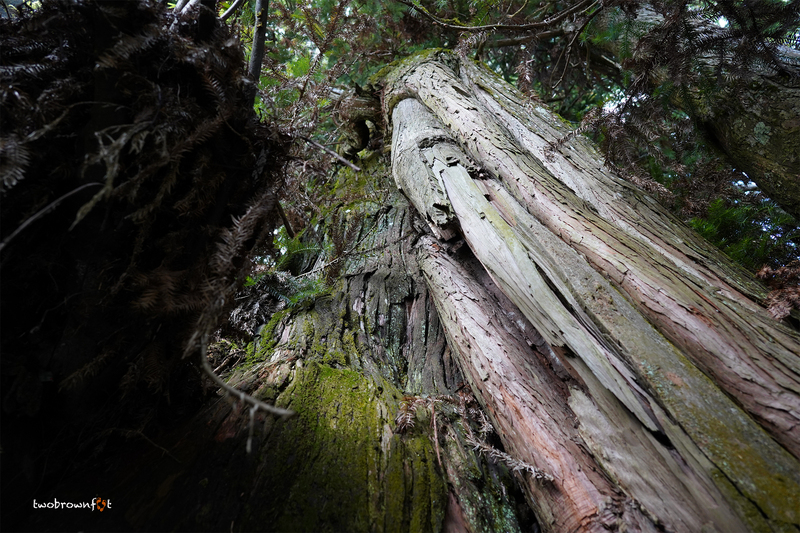 We stopped at a signboard that pointed towards a 3000-year-old Formosan China-fir tree. 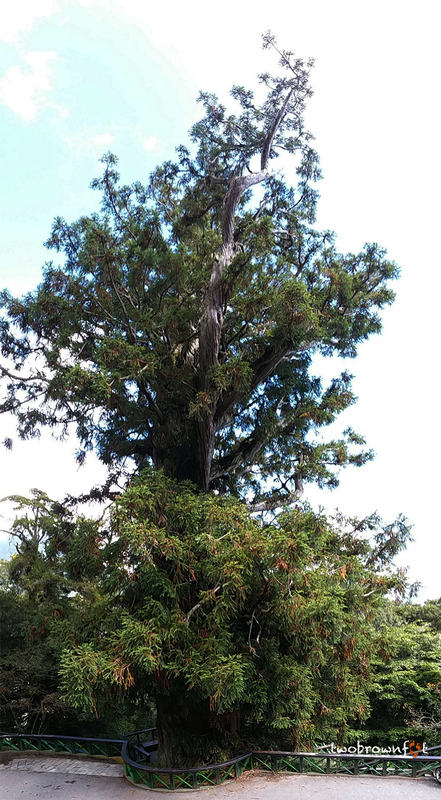 It’s hard to believe a tree survived natural elements and human interference. 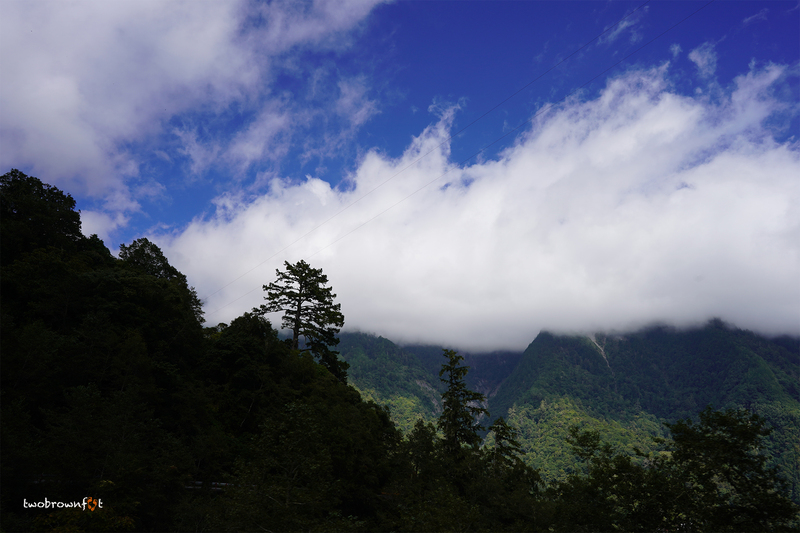 We were at an altitude of roughly 2150 m (7053 ft). Basil captured the tree from below and I took pictures from the parking lot. 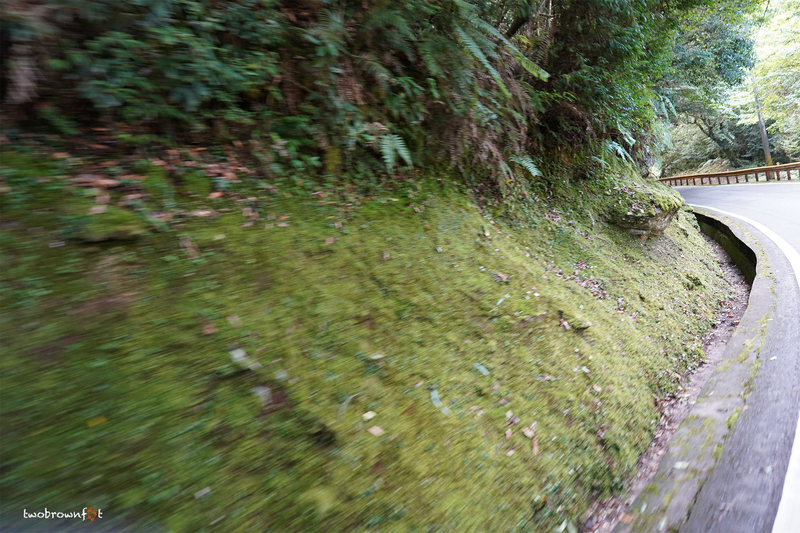 It’s hard to escape winding roads on this trip. 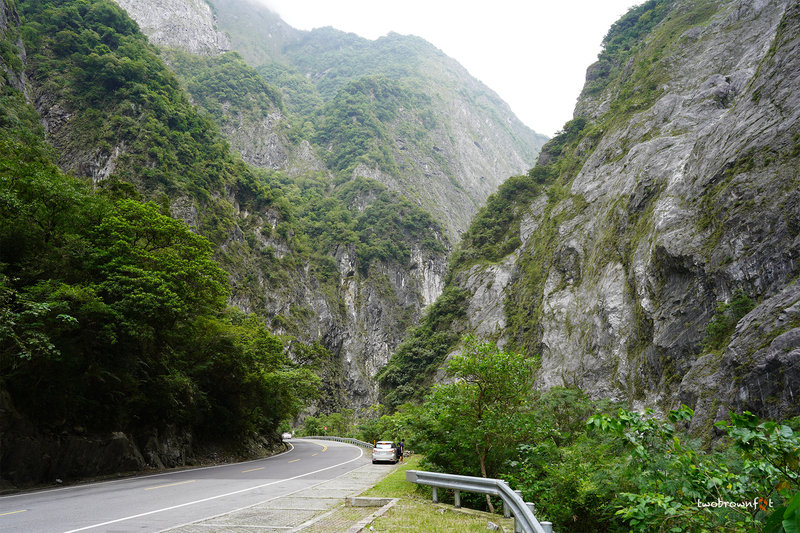 I hadn’t felt this queasy on the earlier trip, but these roads weren’t easy at all. I tried to focus on the scenery outside my window. 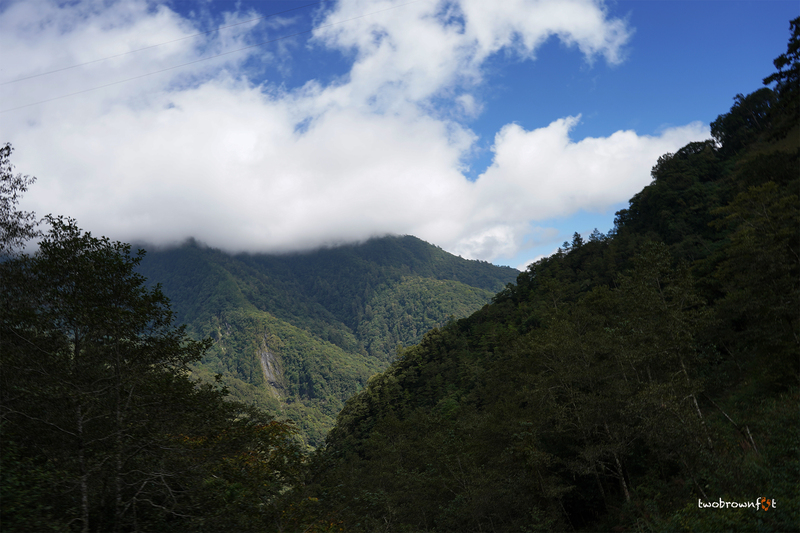 As we descended, we saw the cloud forests we had passed through. 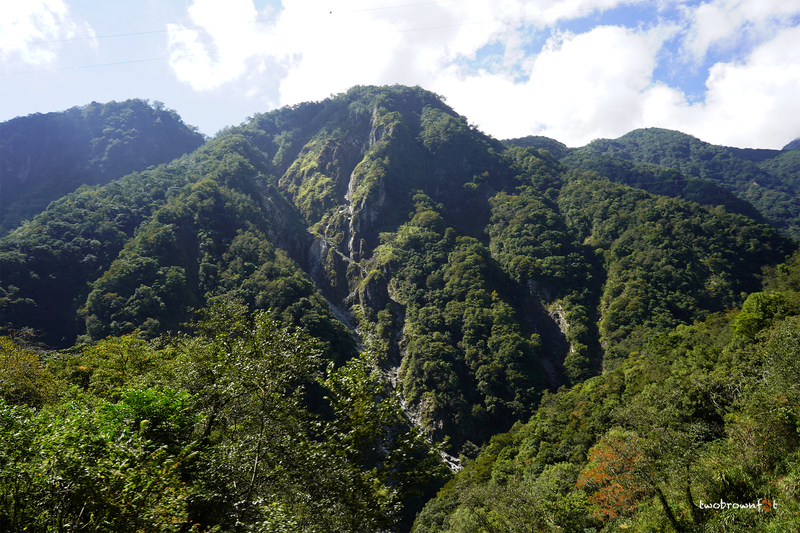 I don’t remember seeing such dense forests in the mountains before. Every sight took my breath away. 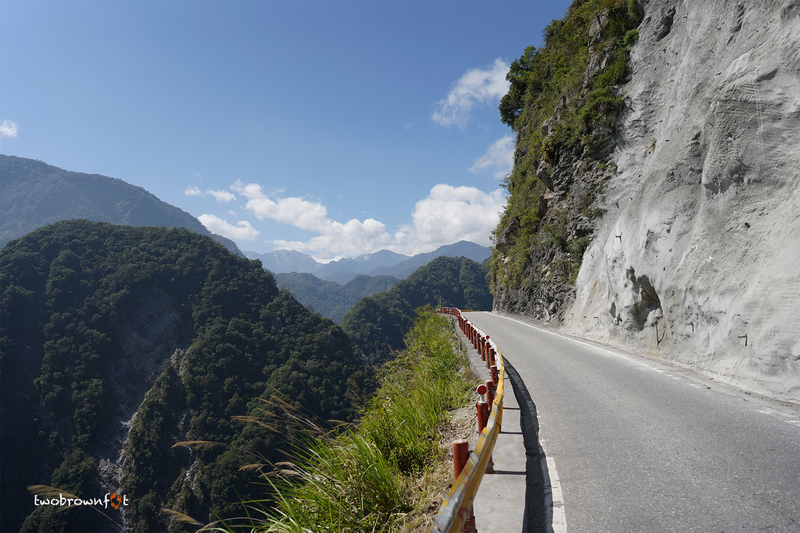 The Central Cross-Island Highway runs through undulating mountain ranges and thick forest cover. 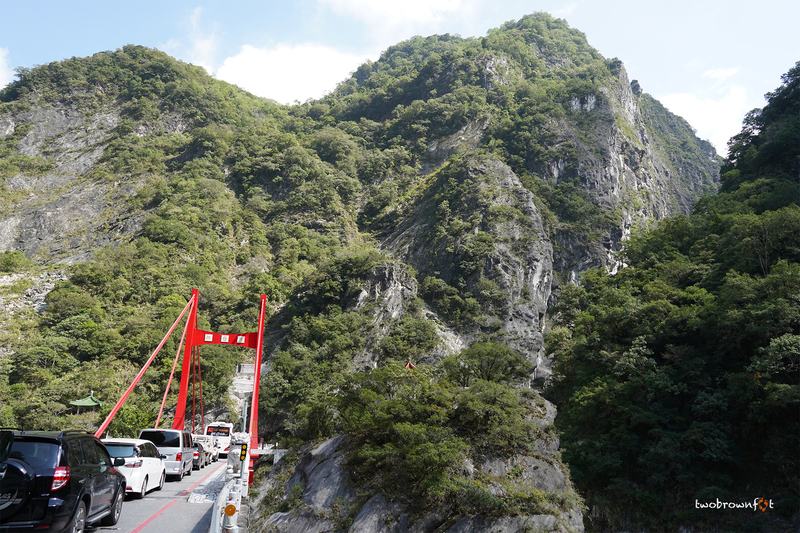 It’s hard to spot the road or bridges that connect different parts of the mountain. 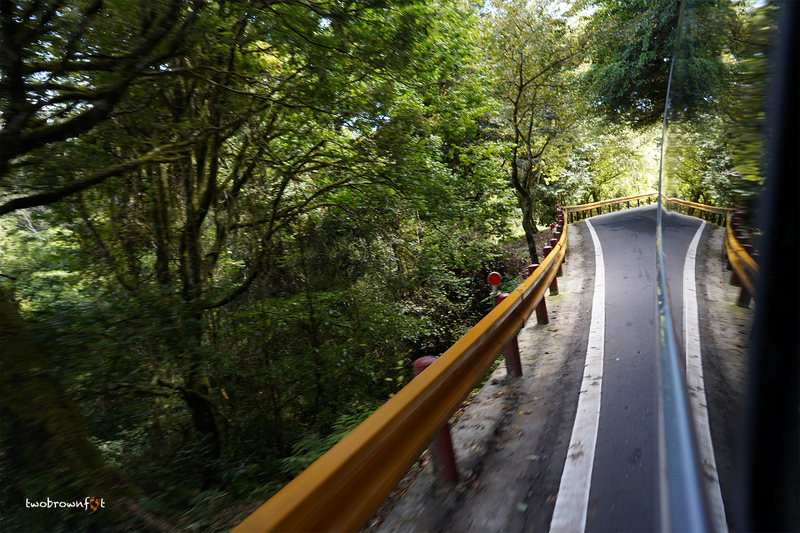 The highway is in excellent condition and it’s a smooth ride — if you forget the curves. 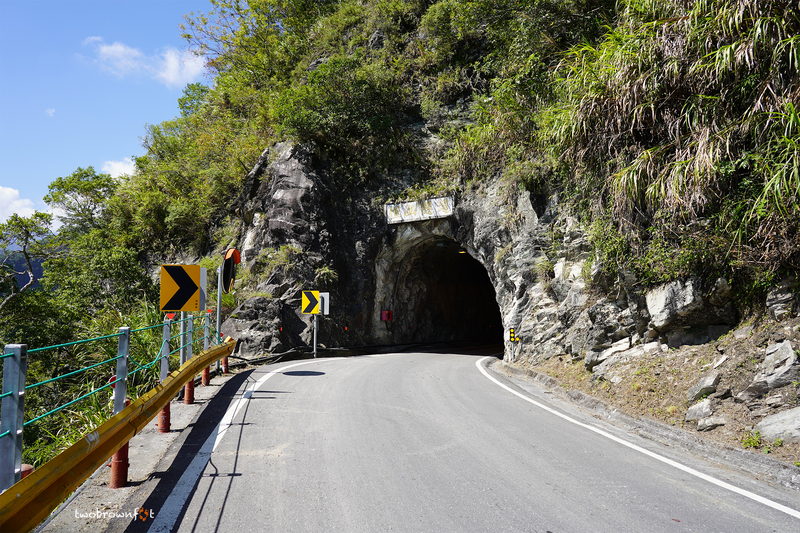 Tunnels are a constant on this road trip. Each tunnel has its own peculiarity. Some are dark and dimly lit. Others are bright passageways between two points. We spent the rest of the trip in silence. The mountains were slowly taking over every frame outside our window. I felt a little better and I could appreciate the views now. Basil did a fantastic job of clicking pictures and capturing those stunning peaks from a moving car. I admire photographers for being patient even in difficult moments. How else would you get a picture? Our driver received information about a roadblock on his walkie-talkie. The highway is always under maintenance and construction. We had to wait for about 20 minutes. Basil chose this opportunity to click pictures and disappeared. When the traffic started moving, I had to search for him. Fortunately, he could see the cars moving and we didn’t cause the second roadblock. 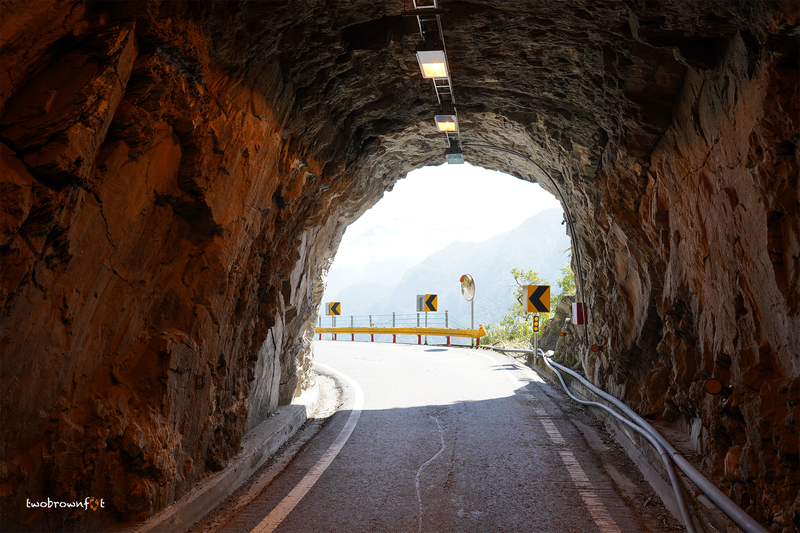 Tunnels cut through gigantic mountains. 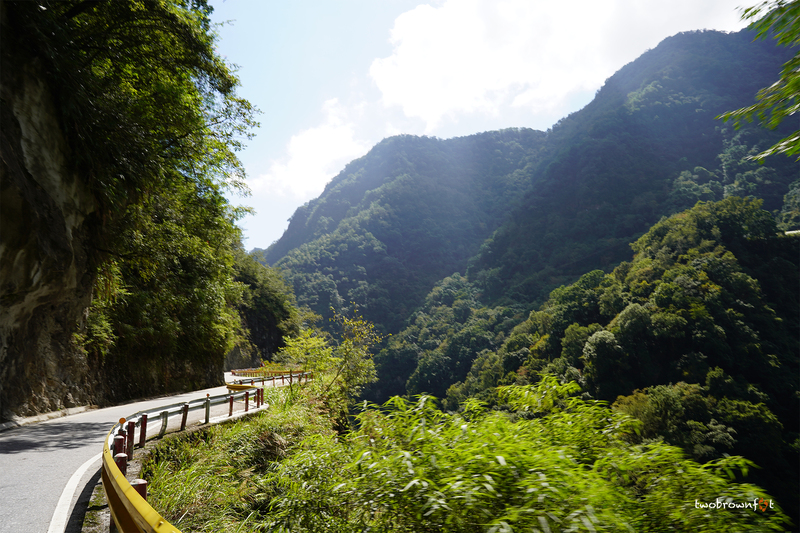 I wouldn’t want to traverse these roads when the weather is bad or during typhoon season. We were lucky to have sunshine. It’s hard to spot anything inside dense forest cover. 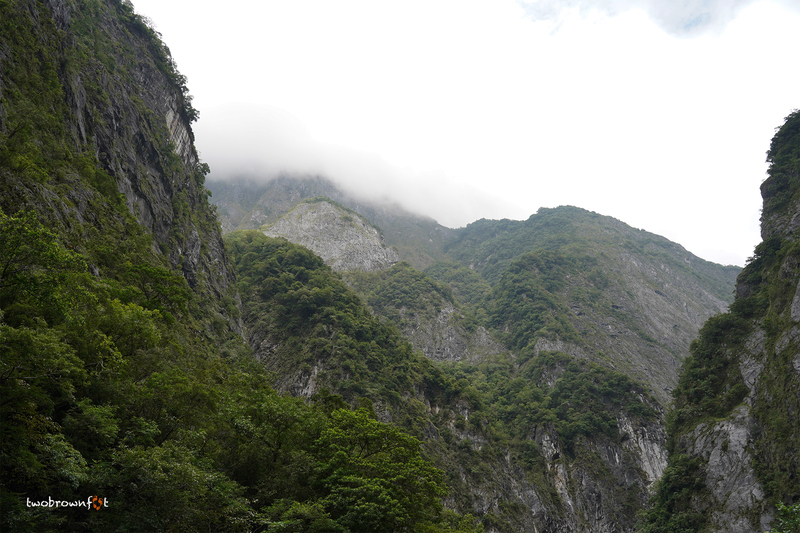 We saw a grey curve at the base of the mountain range. 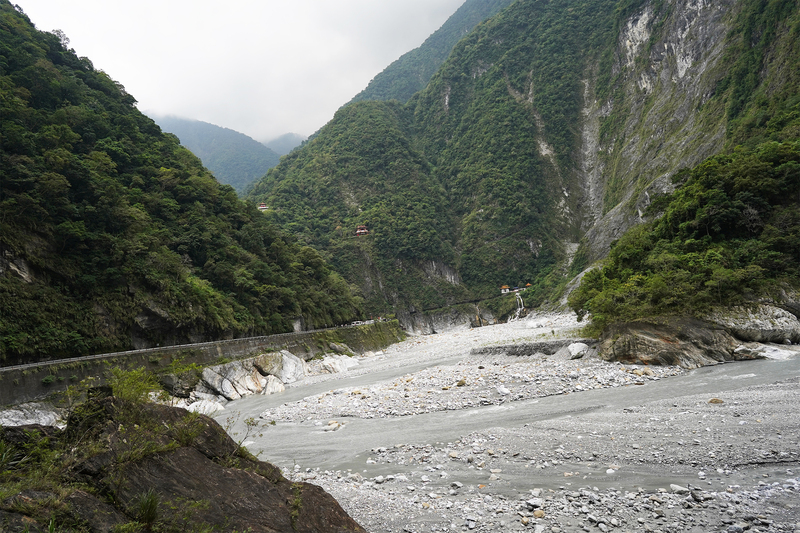 It looked like a waterbody and we were excited because Taroko Gorge wouldn’t be too far away. 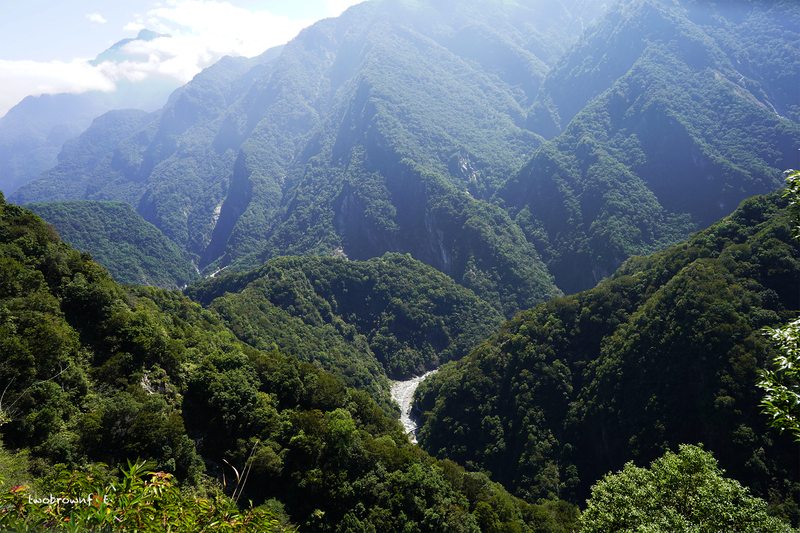 Taroko Gorge is known for its breathtaking views and hidden hiking trails. 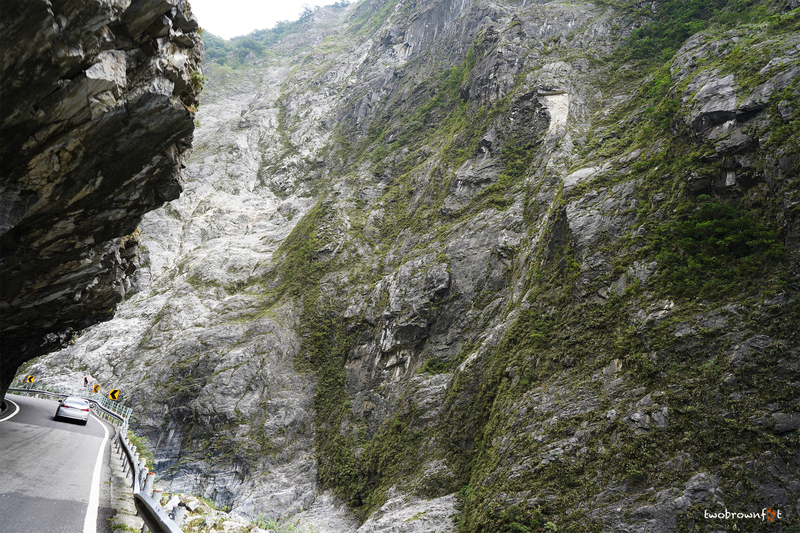 There are many ways to explore this fascinating stretch of chiselled rock in Taroko National Park. 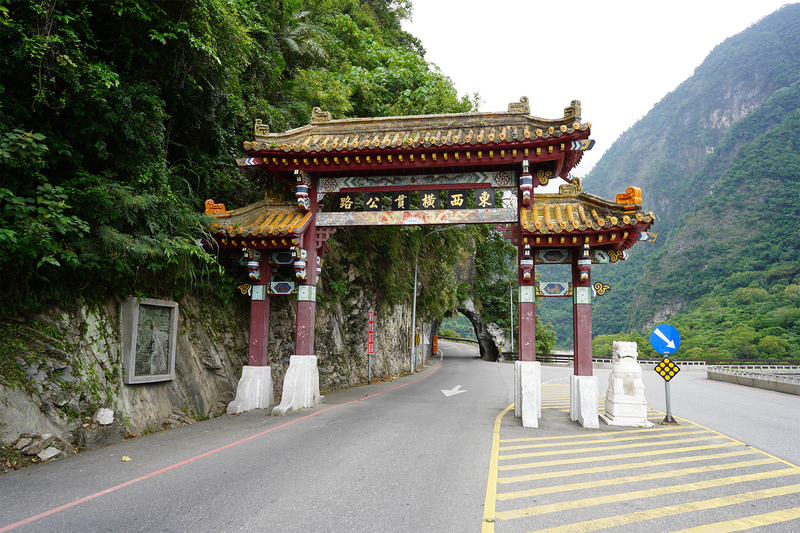 You can rent a cab and stop around the main points of Taroko Gorge. 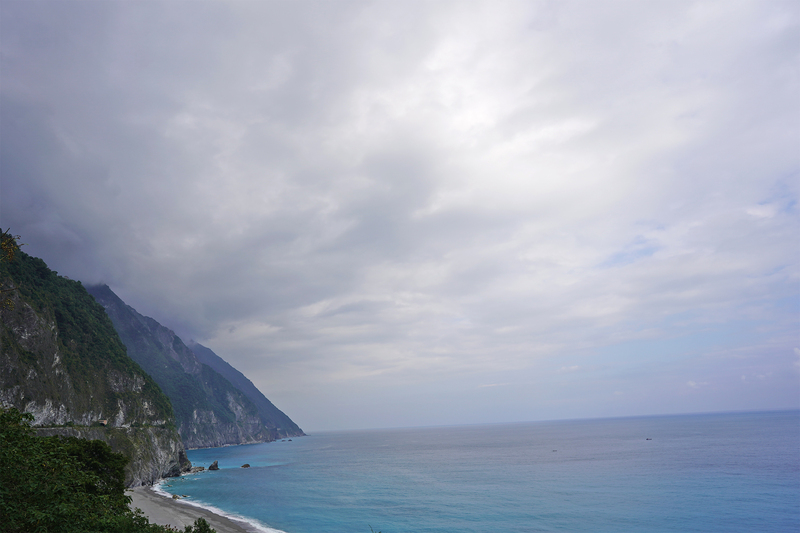 Or you can take the tourist bus from Hualien. 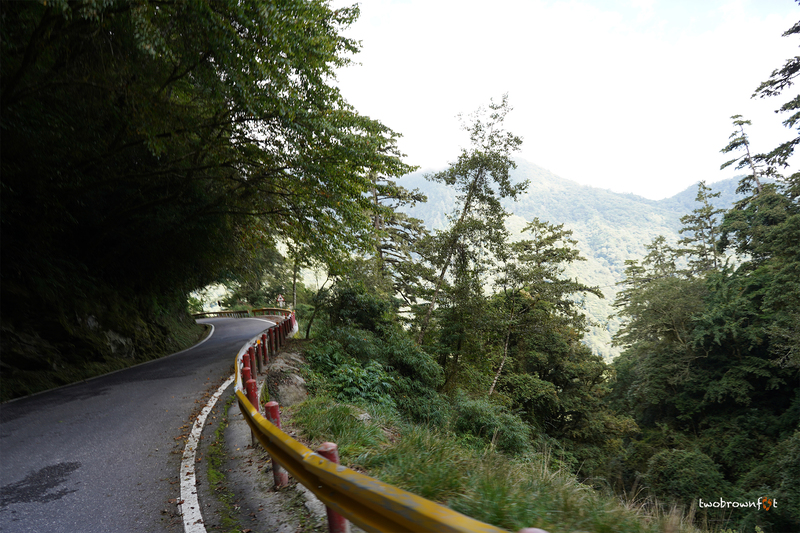 Some adrenaline junkies cycle up the mountain roads and others take a two-wheeler to chug along. 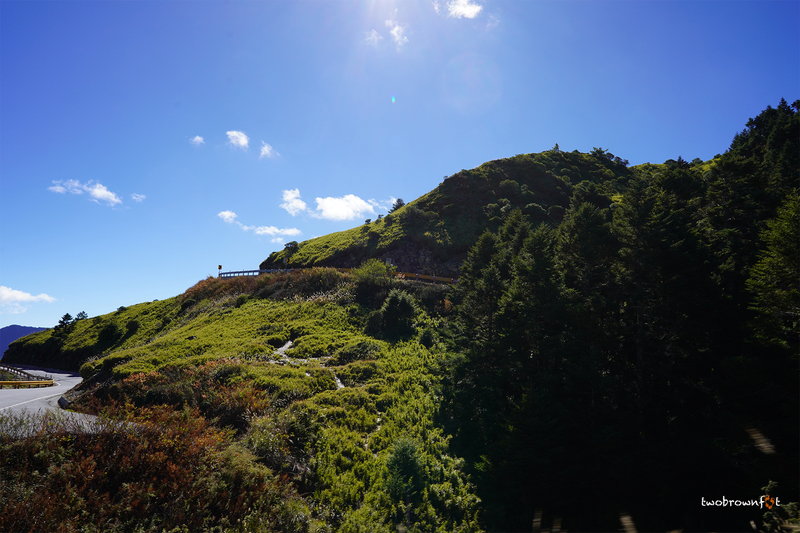 There’s lots to see here and even a week might not be enough to explore all the trails. TIP: Some hiking trails require a permit and it’s best to apply online before your hike. Trails can be closed for repair or due to bad weather. If you have more time, you could choose to stay at Tiangxian. 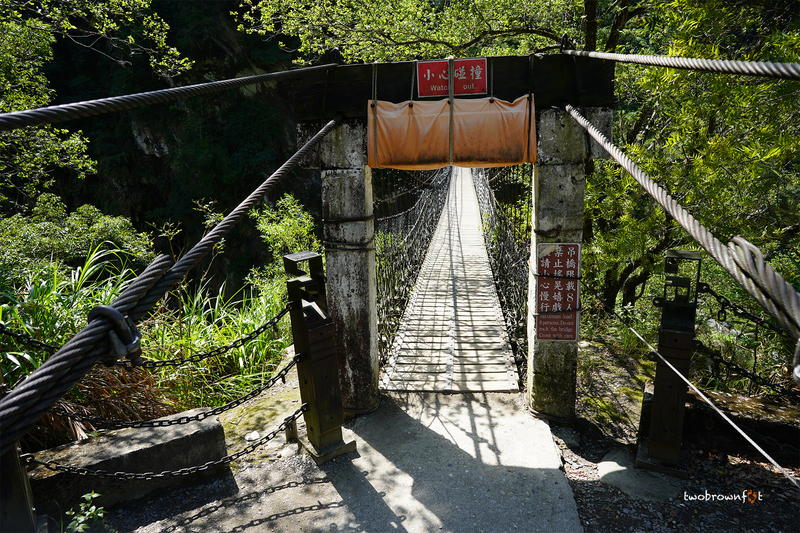 Those who like camping can stay at Heliu or Lushui Campground. 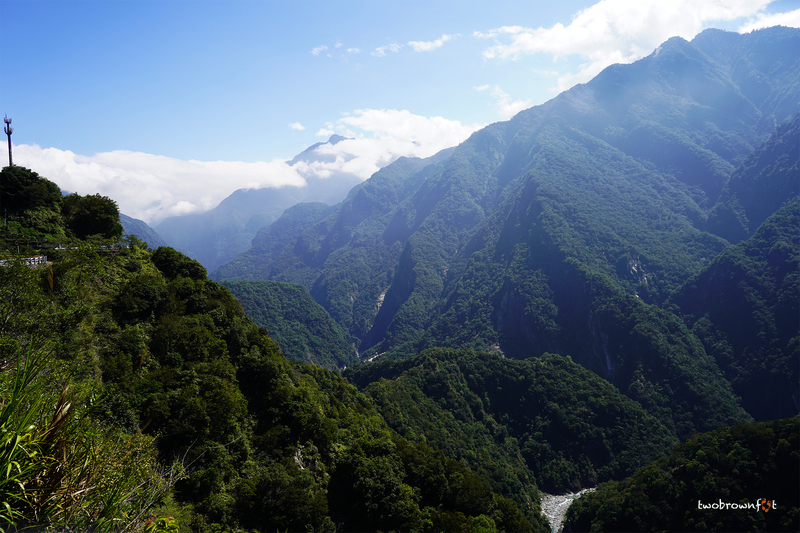 Alternatively, Hualien is the next best option. 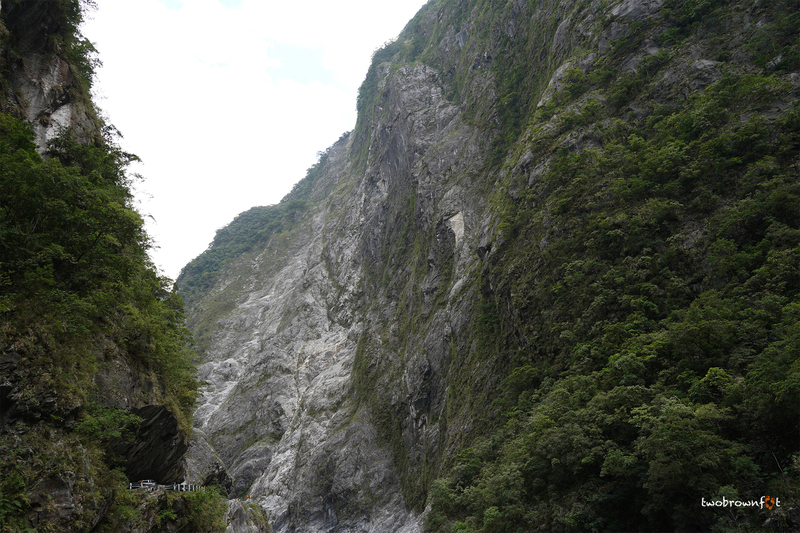 Liwu River cuts through ginormous marble rocks and sculpts them into Taroko Gorge. 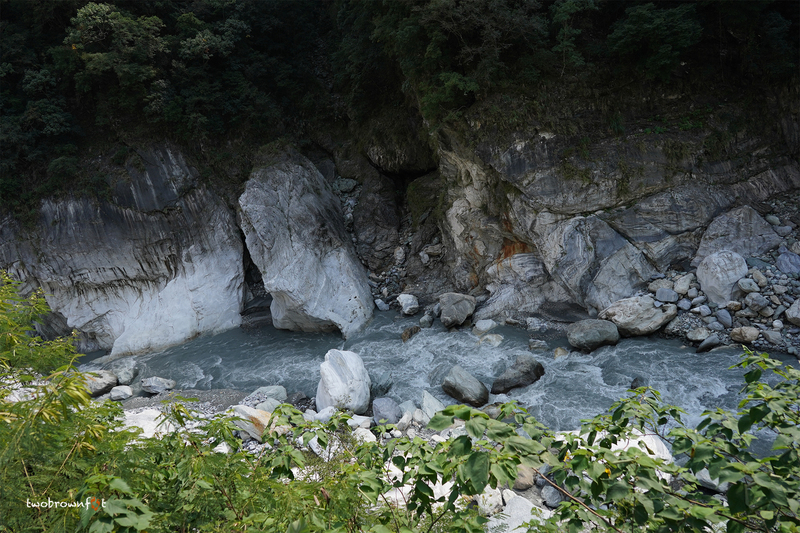 In October, the river was practically dry and it exposed the rocks of the riverbed. Our guide was kind enough to stop at the points we thought we’d like to take a closer look at. Yue Fei Pavilion was built in honour of one of the folk heroes of ancient China. The pavilion is built at a vantage point and offers a stunning view of the river. There’s an old suspension bridge that connects the highway to the old forest access roads on the other side. 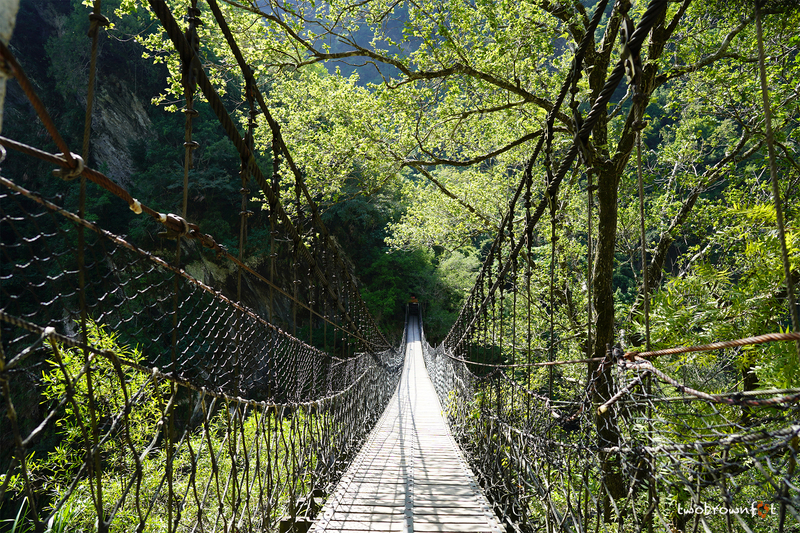 Sadly, we didn’t have a permit to cross the bridge. 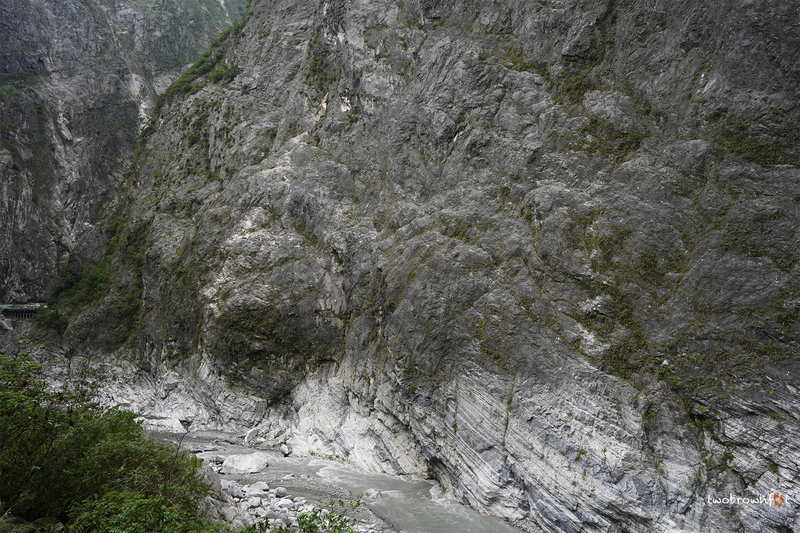 Taroko Gorge is a popular tourist destination in Taiwan. 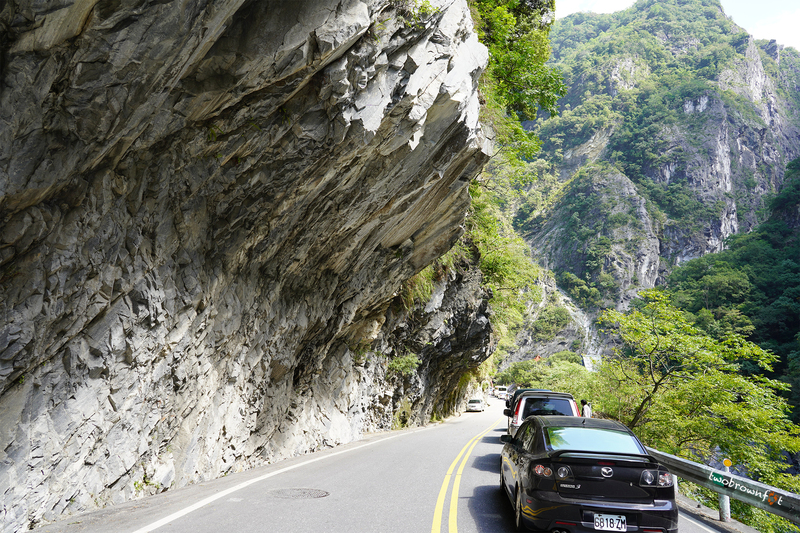 By 12:30 p.m., the highway was clogged with cars and tourist buses from Hualien. 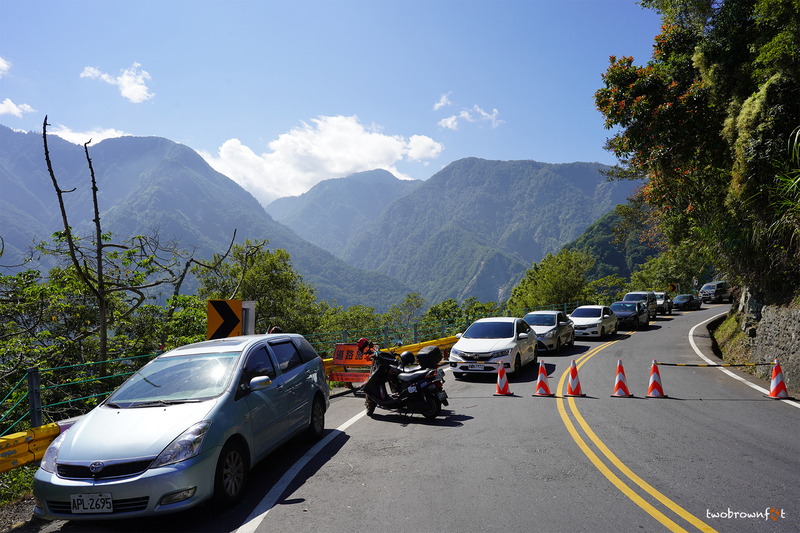 Roadblocks were becoming more common as we approached the famous attractions of Taroko Gorge. 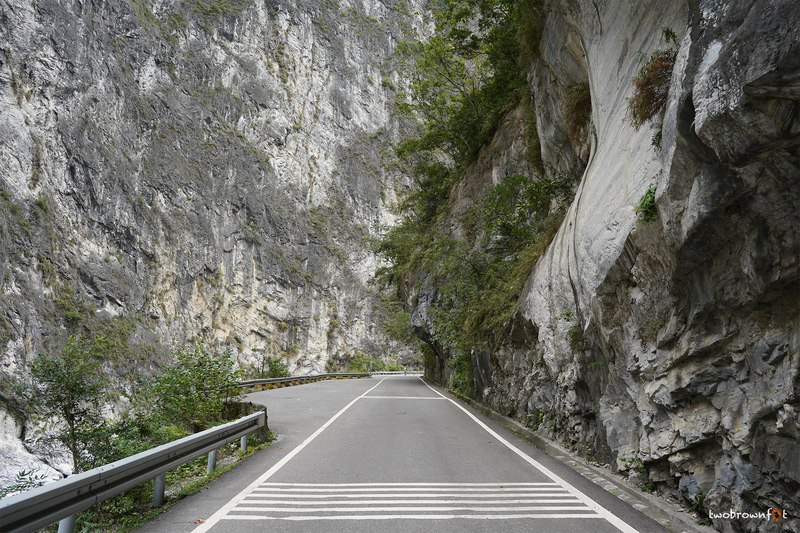 The highway snaked around each bend of rock and cut through narrow passes. We took a pit stop at a scenic location. 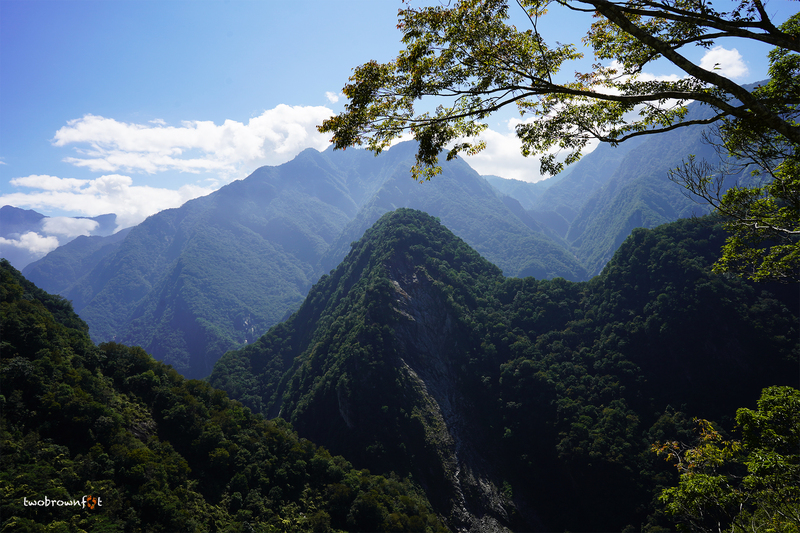 We were dwarfed by those towering peaks and I felt incredibly small. It was a humbling experience. 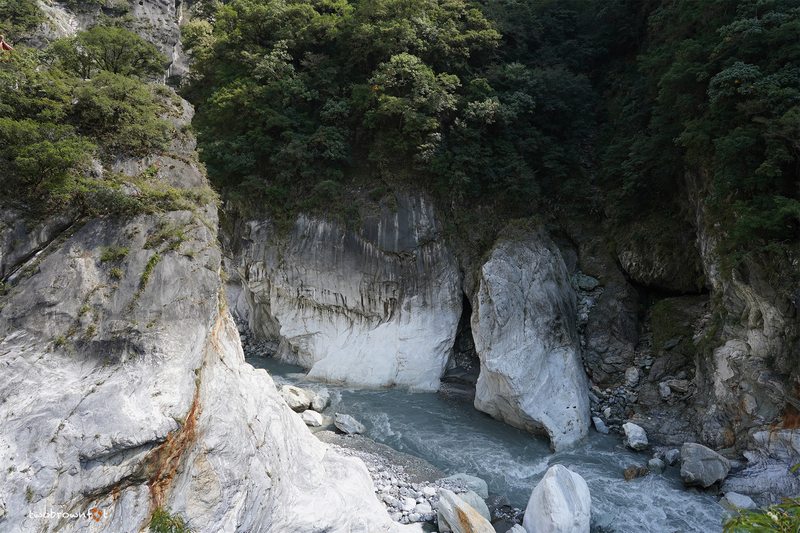 Swallow Grotto is considered to be one of the best spots to admire Taroko Gorge. After nearly missing it, our driver turned the car around, and returned to the viewing spot. Unfortunately, it was closed for repairs on the day of our trip. Our guide parked the car and told us that we could explore as long as the official didn’t stop us. I stayed back (followed the rules) and Basil chose to walk ahead and take a peek. 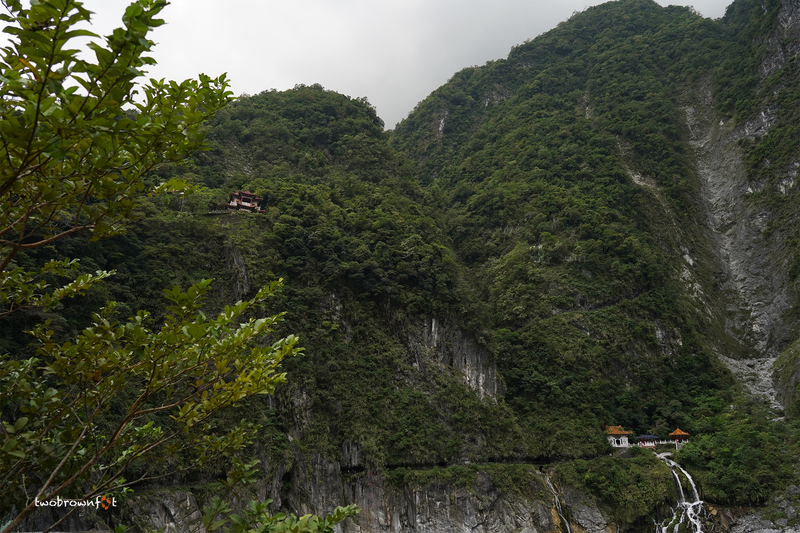 There are many scenic spots hidden in Taroko Gorge. We would have loved to stop and explore them. 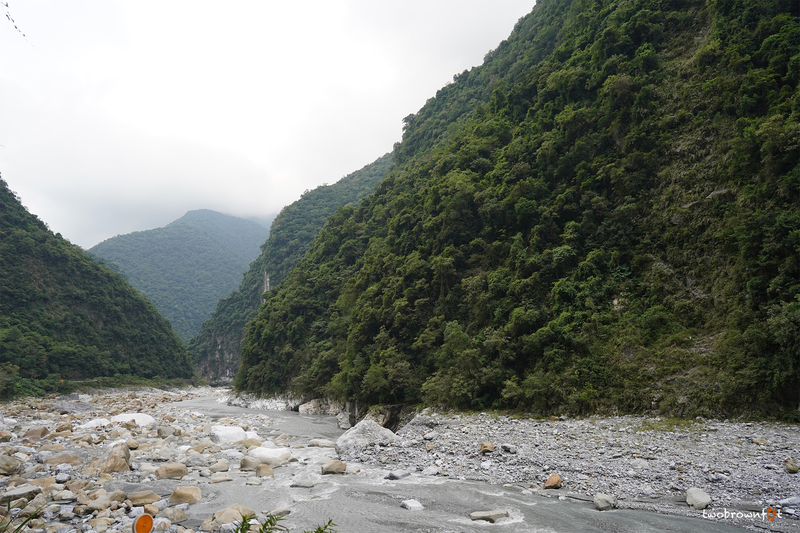 But our driver was in a hurry to get back to Qingjing. We tried to take in and admire most of the views from our window. 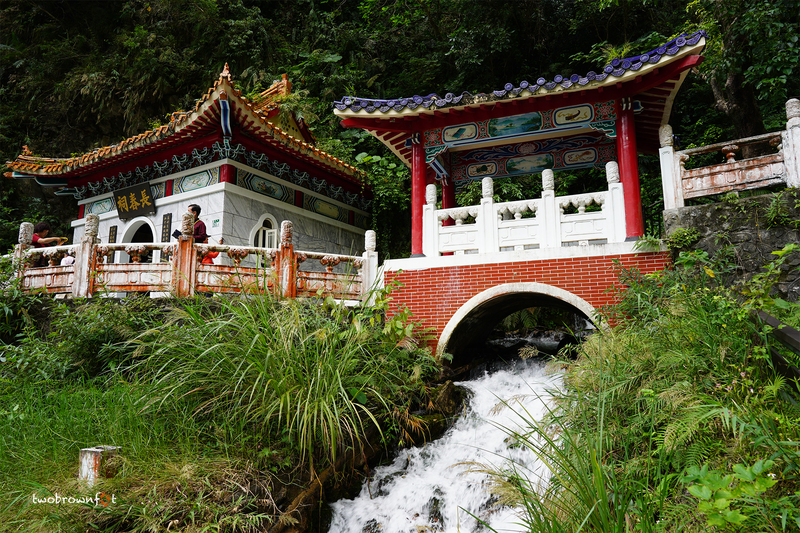 The Eternal Spring Shrine was built in memory of the workers who lost their lives during the construction of the Central Cross-Island Highway. 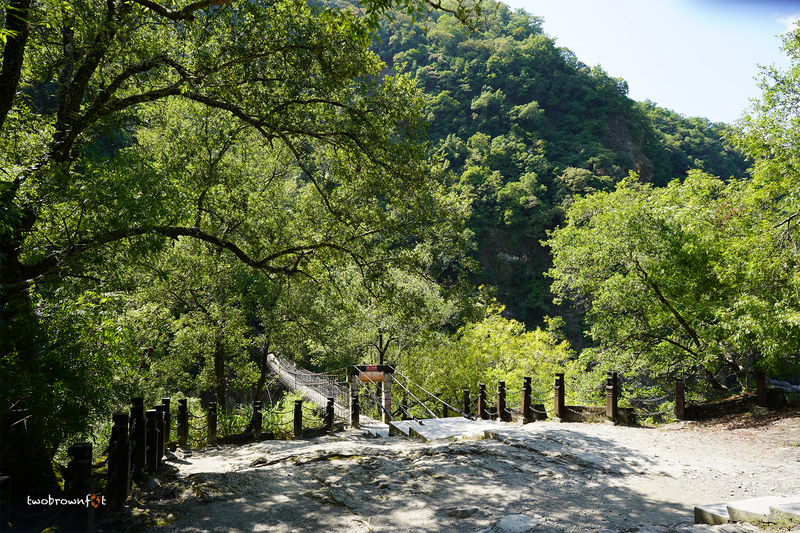 Changchun Waterfall is a natural spring that spurts below the shrine and flows into Liwu River. A flight of stairs opens into a large stone cave. 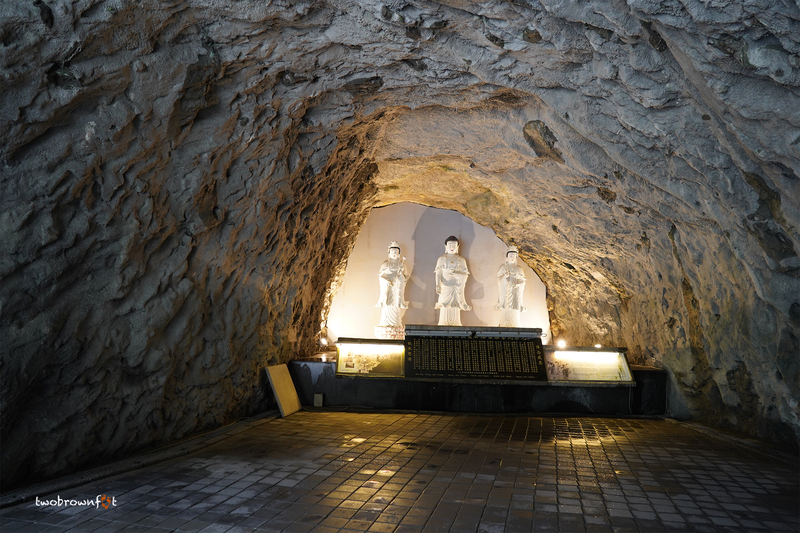 Statues of Lord Buddha are placed at the altar. A narrow passageway leads to the shrine. It isn’t a tricky path, but you have to watch out for the low ceiling and wet floor. 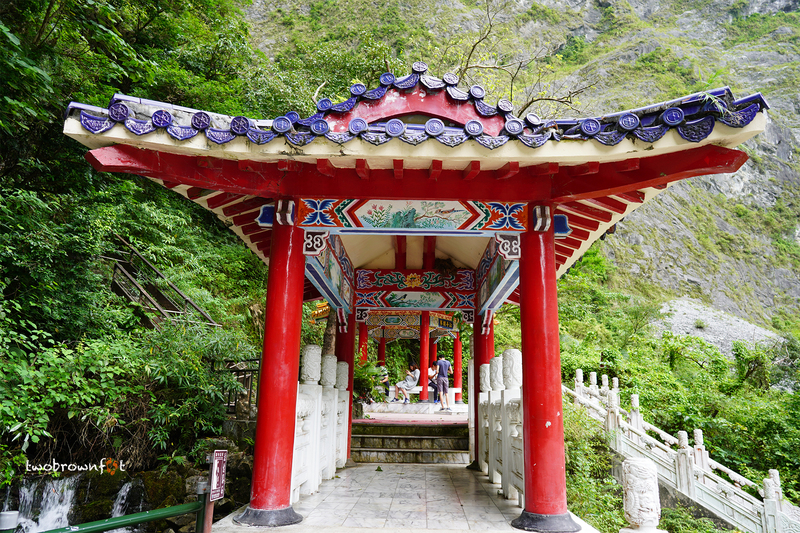 The shrine is nestled in the foothills of the mountains and is one of the most beautiful places that we have visited. A pair of blue butterflies were fluttering around the waterfall. It felt like a magical place. 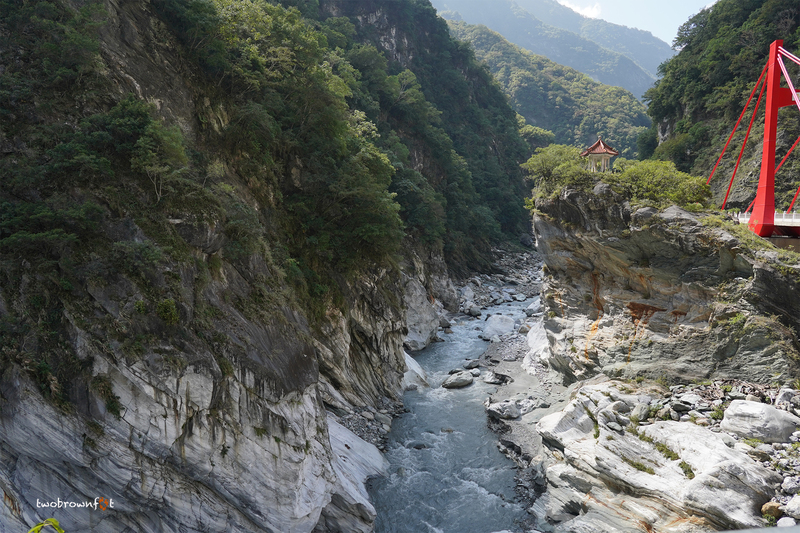 The view of Taroko Gorge from the Eternal Spring Shrine is spectacular. I could have stayed there for a very long time. 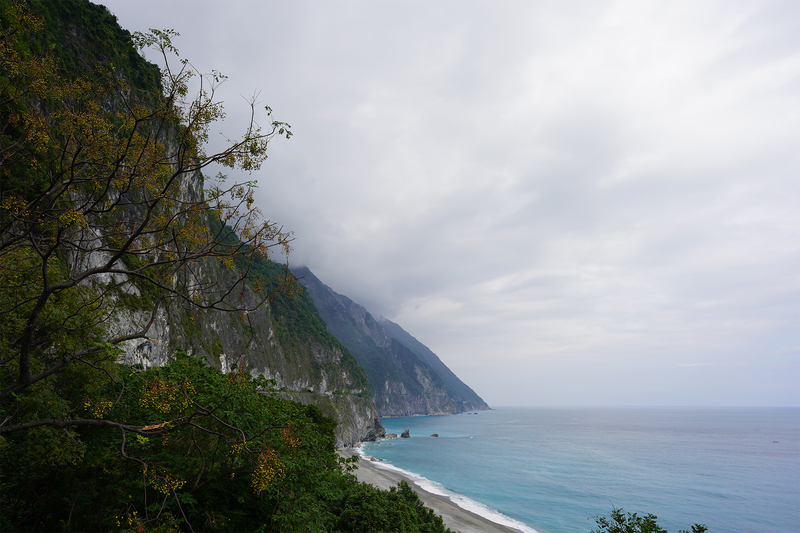 Our driver agreed to take us to Qingshui Cliffs. 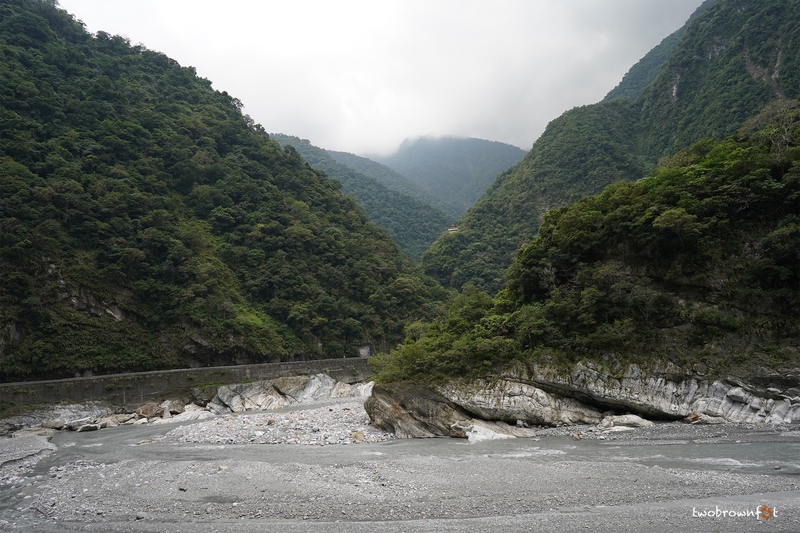 It was a detour from our hotel in Hualien, but he was nice enough to take us there. It was the last spot of our trip. 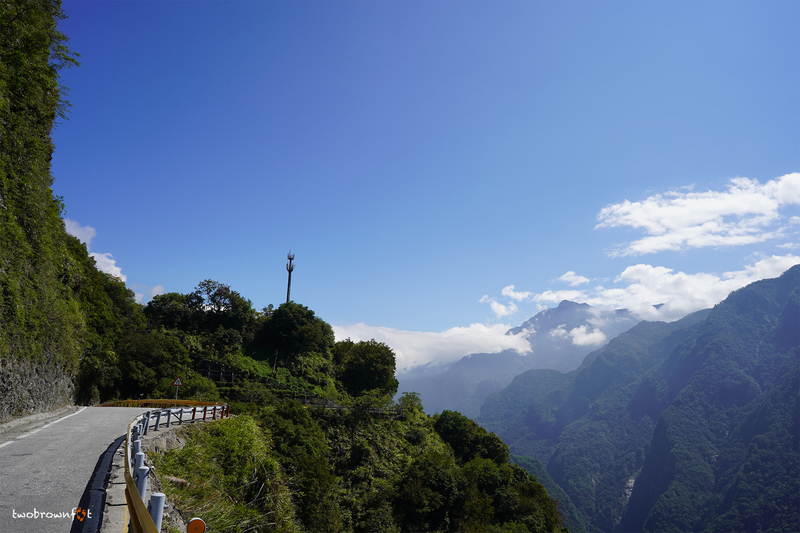 We had seen mountains, cloud forests, a stunning gorge, and now this stellar view of the blue waters and sky. We couldn’t have asked for a better trip. Those mountain views are simply stunning on a clear day. Not quite so welcoming in the gloom. I think I’d forget to take the photos and simply stare 🙂 🙂 Thanks for taking me there. We were incredibly lucky! 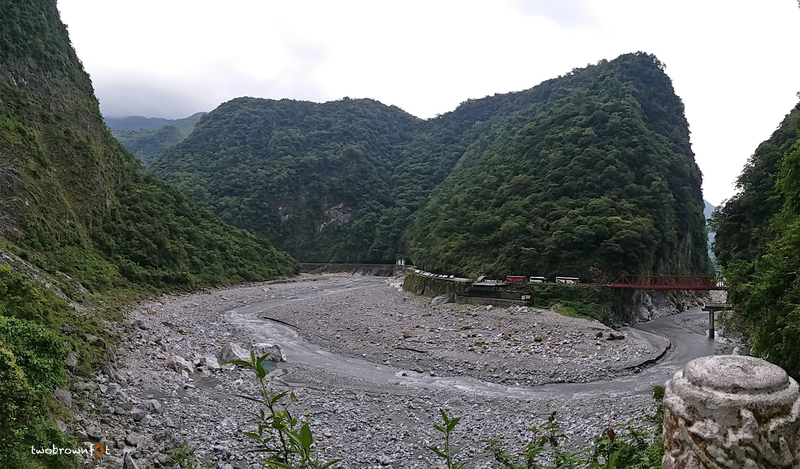 I wouldn’t want to pass those mountains in typhoon season. 😦 I love staring at mountains. Thankfully, Basil loves photography. I can do the dreaming. 🙂 🙂 Hugs! And I like how you section the post with headings and just a bit of text and then let the photos shine. Thank you so much! It was difficult to enjoy the views with those mountain turns. 🙂 I’m glad I made it! I break the text in sections because it’s easier to read. Or at least I hope it is. 🙂 I write around 1400-1700 words per post and upload around 60 (average) pictures (after shortlisting nearly 70 -100 pics). I wanted Basil’s pictures to speak more than my words. I’m so glad you noticed. Thank you for such a wonderful comment! The mountains are simply amazing. One feel very small in such a landscape. 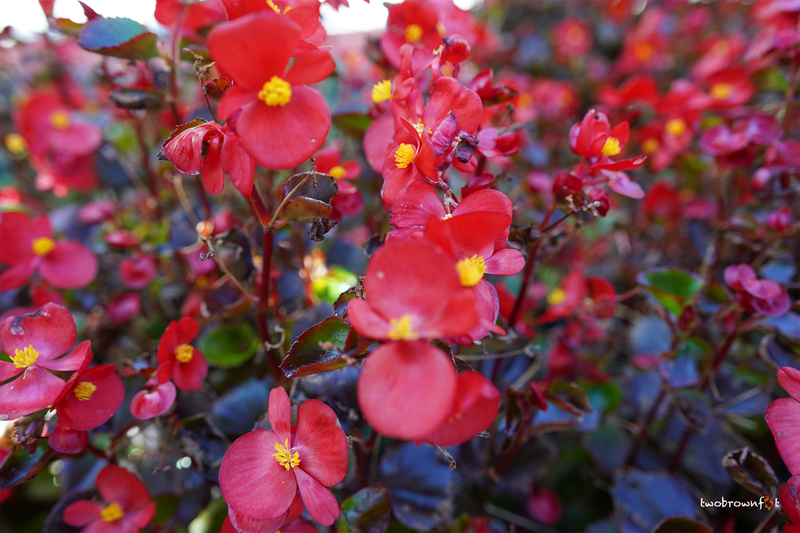 I’m glad you managed to photograph along the way despite the difficulties. Wow, so beautiful. Thanks for this as I’m planning on visiting here this year. Now I’m sure I’ve made a good choice. I agree! 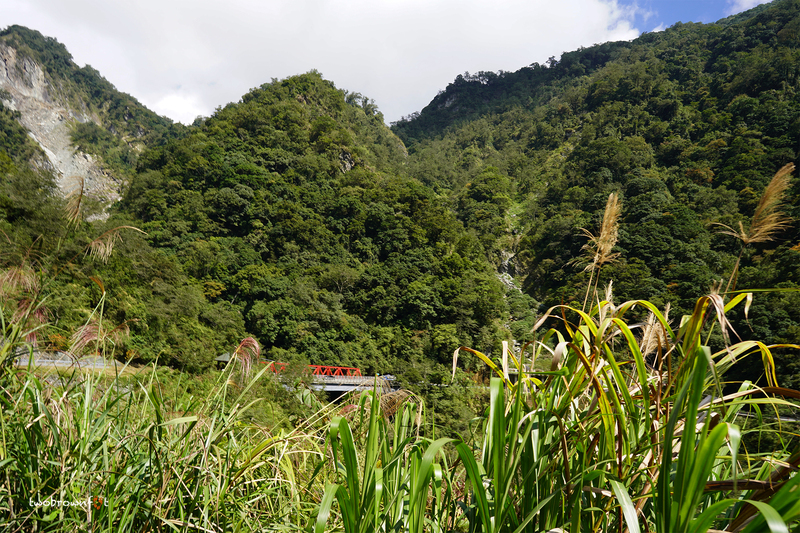 Taiwan’s got so many beautiful places. These pics make me miss the mountains so much. I think I need a mountain break now.